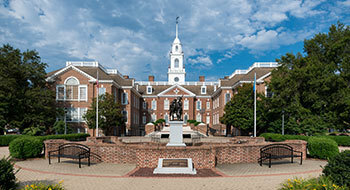 Delaware's healthcare providers may normally think more about treatment options than their government relations strategy, but the industry makes its voice heard. It should come as no surprise that healthcare tops the charts for lobbying activity in Delaware. Morris James' Government Relations group is in the thick of it for a variety of clients. In the beginning of September, the Delaware State News reported that not just the top spot, but the top two active ­lobbying organizations in Delaware grapple with healthcare issues. The hospital organization holds the number one spot for activity. Delaware's physician organization, the Medical Society of Delaware, holds the number two spot. The Medical Society of Delaware wants to help chart the course of care as the nation and state navigate healthcare cost inflation. Morris James helps with policy development and representation in the state legislature as a registered lobbyist for the organization. "benchmarking" process to holistically bend the cost curve in the state. Says Morris James team member Andrew B. Wilson, Esq., "I joined Morris James to serve clients alongside some of the best healthcare attorneys in Delaware. The upcoming legislative and regulatory path for healthcare stakeholders will be a challenge. We look forward to engaging in this critical process on behalf of our clients."